DAT-Air Unique ground-breaking wireless vinyl recording/CD ripping solution now available – DAT-Air from Convert Technologies. Convert Technologies, a UK based technology business with patent protected IP in the Audio and Home Entertainment markets, has just completed the next stage of its recording apps development. DAT-Air is a World-first, bridging all turntables and standard USB CD players to Convert’s mobile recording apps wirelessly. 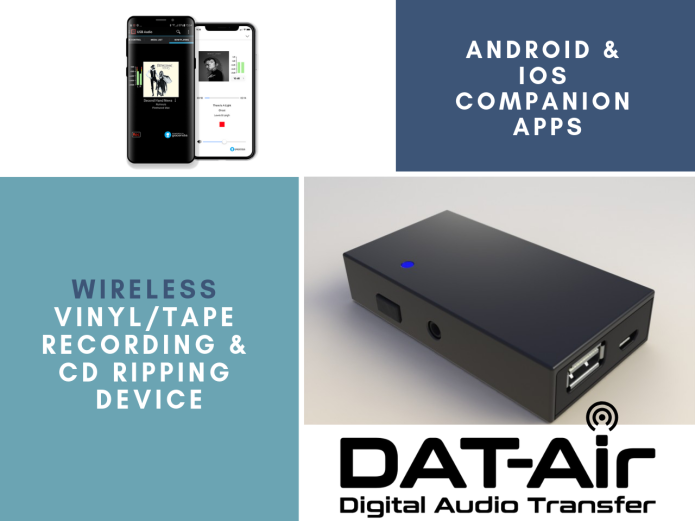 With analogue and USB inputs, DAT-Air provides a standard wireless interface to an iOS or Android mobile device, and Convert’s partnering recording and ripping apps remove all the hard work normally associated with recording; providing fully tagged audio files ready to export or enjoy directly on your mobile device. Convert are engaging with major HiFi brands to license this technology into standalone or fully integrated products. Convert Technologies was founded in 2013, as Entotem Limited, introducing the trading name of Convert Technologies in September 2016. The initial goal and focus were to revolutionise how people enjoyed their music and film collections, and the Plato range was launched in February 2015. Plato proved that it is possible for a music fan to have all their hifi equipment in a straightforward, one-box solution, and was further enhanced when Convert’s pioneering anti-biasing technology enabled Plato Class A to be launched to the market as the first media streamer with an integrated Class A amplifier. In January 2018 Convert Technologies made the decision to concentrate their business 100% on being a technology and licensing company to make the most of opportunities that were available. This move would also provide the focus for the company to be truly disruptive and sustaining with its technology by bringing that to market through other, established brands. “People have said to us it was a brave decision to move away from product manufacturing and distribution, but for us this was the right course of action to maintain the focus required for true innovation. A great example of this is the wireless USB bridge and this next development phase of our wireless vinyl recording solution.” says Dave Belcher, Convert’s Development Director. “Brands are keen to discuss how this technology might work as a stand-alone solution or as part of other products such as the next generation of phono stages. We will explore other industries with this technology in time, however we want to maintain a strong presence with our roots in audio and HiFi markets.” Comments Ian Grostate, Convert’s Commercial Director. Convert Technologies is a highly specialised and disruptive technology company founded in 2013 with a vision to design and develop innovative applications for a range of industries, including the HiFi, Health and Wearables sectors. The company’s vision is to improve upon current technologies and invent new ways of doing things that help and improve the lives of others. © Copyright 2019. Entotem Ltd T/A Convert Technologies.